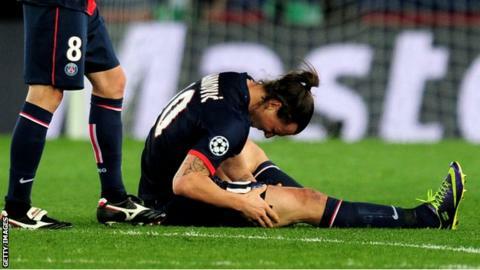 Paris St-Germain striker Zlatan Ibrahimovic is a doubt for the second leg of the Champions League quarter-final with Chelsea through injury. The Swede was substituted after 68 minutes of Wednesday's match, which the French side went on to win 3-1. "It's a muscular problem. He will see the doctor tomorrow (Thursday)," confirmed PSG boss Laurent Blanc. "He wanted to continue but that wasn't reasonable. I hope he is back as soon as possible because we need him." Blanc added: "I'm not sure whether it's his calf or his hamstring. We'll have to look, but it will require a certain amount of rest." The 32-year-old striker has scored 10 goals in the Champions League so far this season, including four goals in the 5-0 win over Anderlecht in October. He has also scored 25 French league goals in this campaign and, before Wednesday's game, Chelsea boss Jose Mourinho, who managed him at Inter Milan, described him as "one of the best players" he has ever coached. "He is a very important player for us so I hope it's not serious," added club president Nasser Al-Khelaifi.